Drivers using the Derbyshire stretch of the M1 could now be slapped with fines for driving at more than 60mph. Highways England has introduced a temporary speed limit between junction 28 for Mansfield and junction 35A at Chapeltown when the stretch is at its busiest in a bid to cut pollution levels. It follows the launch of the ‘smart motorway’ on the 18-mile stretch from Aston to Chapeltown in April 2017. Highways England said the 60mph speed limit had been in place during peak times since the carriageway was converted into a smart motorway last year. It is in force between junction 28 for Mansfield and 35A for Stocksbridge between 7am and 9am and 3pm and 6pm Monday to Friday. 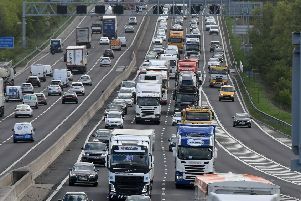 In a statement, it said: “A 60mph speed limit has been in place at peak times on the M1 between Mansfield and Stocksbridge bypass since the smart motorway opened back in April 2017, to maintain air quality levels.